Whispers in the Loggia: "Peace Alone Is Holy, Not War!" – In Francis' City, Pope Gathers World Against "Paganism of Indifference"
"Peace Alone Is Holy, Not War!" 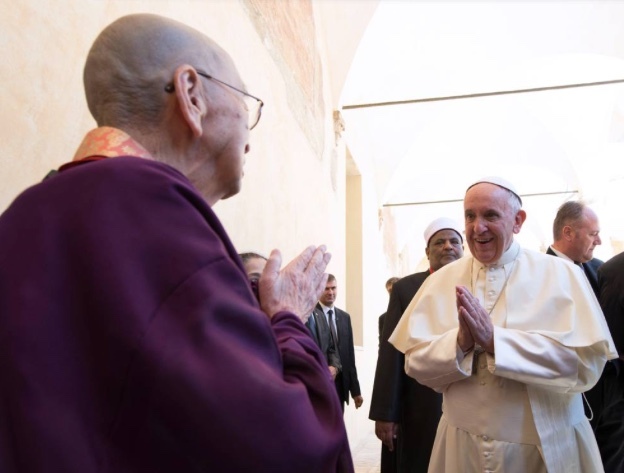 – In Francis' City, Pope Gathers World Against "Paganism of Indifference"
Thirty years since the now-canonized John Paul II infuriated his right flank (in perpetuity) by convening representatives of the world's faiths for a common prayer for peace in the city of St Francis, the first Pope to take the name of the Poverello of Assisi repeated the act today, sharing the stage with a host of ecumenical partners – led by the Ecumenical Patriarch Bartholomew of Constantinople and Archbishop of Canterbury Justin Welby – alongside delegates from each of the other major religious traditions in what was termed a "Thirst For Peace." Capping a three-day congress organized by the Sant'Egidio community (the Rome-based Catholic movement which often takes the lead on social-justice concerns) while the different faiths separated for an afternoon hour to pray according to their own rites around the hilltop Basilica of St Francis, Papa Bergoglio's daylong swing featured a shared lunch for the attendees and twin reflections by the Pope – the first at the dedicated worship for Christians within the church, then a closing address for the entire assembly in the hillside square adjoining the saint's burial-site, with its breathtaking views of the Umbrian countryside. 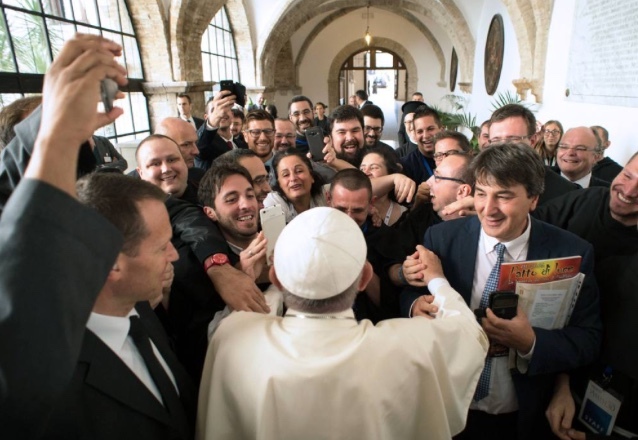 Midway through the fourth year of his pontificate, today's trek marked Francis' third trip to Assisi, the second in just the last six weeks following a low-key stop in early August to mark the 800th anniversary of the "Pardon" sought by St Francis to all who visited the Portiuncula chapel he built, which was subsequently extended to the entire church on its patronal feast of Our Lady of the Angels. With plans for a May trek to Milan having been postponed until 2017 due to the Jubilee, the Poverello's town – which has long credited its freakishly low crime rate to Francis' enduring spirit – has been the only Italian venue the Pope has visited over this Holy Year. Gathered before Jesus crucified, we hear his words ring out also for us: “I thirst” (Jn 19:28). Thirst, more than hunger, is the greatest need of humanity, and also its greatest suffering. Let us contemplate then the mystery of Almighty God, who in his mercy became poor among men. What does the Lord thirst for? Certainly for water, that element essential for life. But above all for love, that element no less essential for living. He thirsts to give us the living waters of his love, but also to receive our love. The prophet Jeremiah expressed God’s appreciation of our love: “I remember the devotion of your youth, your love as a bride” (Jer 2:2). 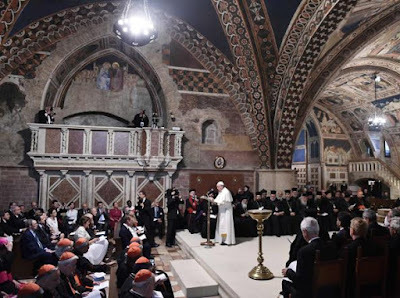 But he also gave voice to divine suffering, when ungrateful man abandoned love – it seems as if the Lord is also speaking these words today – “they have forsaken me, the fountain of living waters, and hewed out cisterns for themselves, broken cisterns, that can hold no water” (v. 13). It is the tragedy of the “withered heart”, of love not requited, a tragedy that unfolds again in the Gospel, when in response to Jesus’ thirst man offers him vinegar, spoiled wine. As the psalmist prophetically lamented: “For my thirst they gave me vinegar to drink” (Ps 69:21). “Love is not loved”: this reality, according to some accounts, is what upset Saint Francis of Assisi. For love of the suffering Lord, he was not ashamed to cry out and grieve loudly (cf. Fonti Francescane, no. 1413). This same reality must be in our hearts as we contemplate Christ Crucified, he who thirsts for love. Mother Teresa of Calcutta desired that in the chapel of every community of her sisters the words “I thirst” would be written next to the crucifix. Her response was to quench Jesus’ thirst for love on the Cross through service to the poorest of the poor. The Lord’s thirst is indeed quenched by our compassionate love; he is consoled when, in his name, we bend down to another’s suffering. On the day of judgment they will be called “blessed” who gave drink to those who were thirsty, who offered true gestures of love to those in need: “As you did it to one of the least of these my brethren, you did it to me” (Mt 25:40). Jesus’ words challenge us, they seek a place in our heart and a response that involves our whole life. In his “I thirst” we can hear the voice of the suffering, the hidden cry of the little innocent ones to whom the light of this world is denied, the sorrowful plea of the poor and those most in need of peace. The victims of war, which sullies people with hate and the earth with arms, plead for peace; our brothers and sisters, who live under the threat of bombs and are forced to leave their homes into the unknown, stripped of everything, plead for peace. They are all brothers and sisters of the Crucified One, the little ones of his Kingdom, the wounded and parched members of his body. They thirst. But they are frequently given, like Jesus, the bitter vinegar of rejection. Who listens to them? Who bothers responding to them? Far too often they encounter the deafening silence of indifference, the selfishness of those annoyed at being pestered, the coldness of those who silence their cry for help with the same ease with which television channels are changed. Before Christ Crucified, “the power and wisdom of God” (1 Cor 1:24), we Christians are called to contemplate the mystery of Love not loved and to pour out mercy upon the world. On the cross, the tree of life, evil was transformed into good; we too, as disciples of the Crucified One, are called to be “trees of life” that absorb the contamination of indifference and restore the pure air of love to the world. From the side of Christ on the Cross water flowed, that symbol of the Spirit who gives life (cf. Jn 19:34); so that from us, his faithful, compassion may flow forth for all who thirst today. Like Mary by the Cross, may the Lord grant us to be united to him and close to those who suffer. Drawing near to those living as crucified, and strengthened by the love of Jesus Crucified and Risen, may our harmony and communion deepen even more. “For he is our peace” (Eph 2:14), he who came to preach peace to those near and far (cf. v. 17). May he keep us all in his love and gather us together in unity, that path which we are all on, so that we may be “one” (Jn 17:21) as he desires.